Armstrong is a global provider of innovative water temperature control solutions for Institutional hygiene and Industrial process applications. For Healthcare, Hospitality, Educational and Correctional Institutional buildings, Armstrong provides Digital (The Brain®) and Thermostatic solutions that place user safety and Legionella risk reduction at the forefront of hot water system design, operation and maintenance. For Food, Pharmaceutical and Chemical processing Industrial plants, Armstrong provides EmechTM Digital Steam/Water Mixers for instantaneous hot water generation and EmechTM Digital Control Valves for mixed water temperature control that enhance system performance and reliability. The 3-port mixing valve utilizes ceramic shear action disc technology to provide tight shut-off, high pressure differential capability, and long life integrity. Fitted with the electronic actuator and integrated temperature sensor, the system delivers high performance stand-alone closed-loop temperature control. With the temperature feedback signal, the actuator provides temperature control accuracy to ± 1°F (± 0.5°C) over a 32°F - 212°F (0°C - 100°C) control range, capable of blending from 0% to 100% of either inlet temperature. Even with sudden changes of inlet pressure and temperature to the valve, the actuator controller aggressively minimizes outlet temperature variations, making the system ideal for use in industrial applications as a simple stand-alone or integrated mixing solution. The 3-port valve utilizes a unique shear action disc technology and swirl-mix body geometry to provide high performance dynamic fluid mixing. The nature of the valve seat design minimizes disc wear, outperforming conventionally seated valves, minimizing seal replacement and plant downtime. The calibrated temperature feedback signal in combination with the fast acting actuator provides temperature control accuracy to ± 2°F (± 1°C) over a 32°F - 212°F (0°C - 100°C) control range, capable of blending from 0% to 100% of either inlet temperature. The shear action disc design of the actuated valve provides precise controlled mixing of steam and water. Fitted with the electronic actuator and an integrated temperature sensor, the system ensures fast, accurate and stable temperature control. The single compact assembly simplifies installation. The independence of these stand-alone units provide a reliable solution for hot water supply for industrial applications. The calibrated temperature probe fits into a 1/8" NPSM port in the outlet, and connects via a cable to the actuator. With this temperature feedback signal, the actuator can provide temperature control accuracy of ±1°F (±0.5°C) and up to 200°F (95°C) heated water at the outlet. 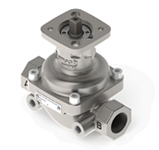 The valves can handle a variety of input temperatures and pressures to give a temperature rise. With sudden changes of inlet pressure and temperature to the valve, the controller aggressively minimizes outlet temperature variations. The Emech 2 port flow control valve and actuator system utilizes ceramic shear action disc technology to provide tight shut-off, high pressure differential capability and long life integrity. When combined with the Emech electric actuator and Emech sensor, high speed stand along closed loop temperature control of applications can be achieved. The Emech 2 port valve utilizes ceramic shear action discs as the dynamic seal. The extremely hard nature of ceramic produces outstanding resistance to wear and cavitation damage compared with conventional elastomer and plastic seated valves, minimizing seal replacement and plant downtime. The Emech 2 port valve utilizes ceramic shear action disc technology to provide tight shut-off, high pressure differential capability and long life integrity. Combined with the Emech electronic actuator, high speed stand-alone closed loop temperature control is possible. The Emech port valve utilizes ceramic shear action discs as the dynamic seal. Emech actuators offer intelligent control. They provide the ability to sense at the source, and provide reliable control, either in an independent standalone environment, or as an integral part in PLC plant systems. Depending on the application, butterfly and rotational valve control can be significantly enhanced by the installation of an Emech actuator. actuation solutions for 0° to 350° applications up to 100 Nm ( 885 in.lb ). Emergency Fixtures. . . Model Z358 series are designed specifically to provide temperature controlled water to emergency fixtures. Tepid flushing fluid is considered necessary in all types of emergency equipment applications. 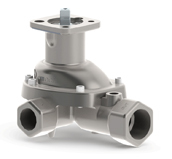 Z358-20 is a Thermostatic Mixing Valve of "sealed for life" disposable cartridge construction. Compact design and topor bottom blended water outlet make Z358-20 ideal for OEM, new construction and upgrade/retrofit installations. For Emergency Drench Showers. Model Z358-20 will pass ANSI specified minimum of 20 gpm/76 lpm (actual 23 gpm/87 lpm) and will flow a minimum of 10 gpm (38 lpm) from direct cold water supply in hot failure mode at 40 psi (2.7 bar) maintained equal inlet supply pressure. For Emergency Eye Wash Stations. For single or multiplefixture installation, Model Z358-20 will control accurately atflow rates from 20 gpm (76 lpm) to below 1 gpm (3.8 lpm). In flow applications between 20 gpm (76 lpm) and 10 gpm(38 lpm), Z358-20 will pass approximately 50% of original flow setting in hot failure mode. In flow applications between 10 gpm (38 lpm) and 5 gpm (19 lpm), Z358-20 will pass approximately 80% of original flow setting in hot failure mode.In flow applications below 5 gpm (19 lpm), Z358-20 will pass approximately 95% of original flow setting in hot failure mode. Site Adjustable - Mechanical maximum-temperature limit stop and single-temperature locking features as a function of the temperature control handle design. Thermal shutdown feature is designed to protect user from unsafe water temperatures or hot water/chemical reaction should cold supply be interrupted during use. Unique constant cold water flow design ensures that in the event of a hot supply failure the Model Z358-20 will allow cold water to flow to fixture. Unique constant cold water flow feature allows the inlet hot water supply to be set within a prescribed range, thus limiting the potential outlet temperature to a safe maximum in the event of misadjustment, unauthorized tampering or thermostat failure. This feature presumes that the correct initial commissioning was performed and that the cold water supply has not been interrupted. Model Z358-20-FMC is a Thermostatic Mixing Valve for remote/secure cabinet mount. This product has been designed specifically to provide temperature controlled water to emergency fixtures. Model Z358-20-FMC is supplied as standard* fully assembled and pressure- tested, in an 26" x 30" x 10" stainless steel recessed cabinet with a 2" flange. Cabinet has a polishedstainless steel piano-hinged door with a keyed cylinder lock. Model Z358-20-FMC is supplied as standard under this model number for top inlet hot and cold water supplies and a top outlet with a left-hand hinged door as indicated in the picture and drawing. Model Z358-20-FMC can be specified/ordered with the following piping configurations under the following model numbers. Model Z358-40 has been designed specifically to provide temperature controlled water to emergency fixtures as detailed in ANSI Z358.1-2009. Model Z358-40 is a Thermostatic Mixing Valve designed specifically to deliver tepid water to emergency fixtures. Compact design and top or bottom blended water outlet makes Model Z358-40 ideal for OEM, new construction and upgrade/retrofit installations. For Emergency Drench Showers. Model Z358-40 will pass ANSI specified minimum of 20 gpm (75.7 lpm)—actual 46 gpm (147 lpm)—and will flow a minimum of 15 gpm (57 lpm) from direct cold water supply in hot failure mode at 45 psi (3 bar) pressure drop. For Emergency Eye Wash Stations. For single or multiple fixture installation, Model Z358-40 will control accurately at flow rates from 40 gpm (151 lpm) to below 2 gpm (7 lpm) - actual 46 gpm @ 45 psi pressure drop. In 40 gpm (151 lpm) flow applications, Z358-40 will pass approximately 40% of original flow setting in hot failure mode. In 30 gpm (114 lpm) flow applications, Z358-40 will pass approximately 50% of original flow setting in hot failure mode. In 15 gpm (57 lpm) flow applications, Z358-40 will pass approximately 75% of original flow setting in hot failure mode. Unique constant cold water flow design ensures that in the event of a hot supply failure the Model Z358-40 will allow cold water to flow to fixture. Model Z358-40-FMC is a Thermostatic Mixing Valve for remote/secure cabinet mount. This product has been designed specifically to provide tepid water to emergency fixtures as detailed in ANSI Z358.1-2009 specifications. Model Z358-40-FMC is supplied as standard* fully assembled and pressure-tested, in an 26" x 30" x 10" stainless steel recessed cabinet with a 2" flange. Cabinet has a polished stainless steel piano-hinged door with a keyed cylinder lock. Model Z358-40-FMC is supplied as standard under this model number for top inlet hot and cold water supplies and a top outlet with a left-hand hinged door as indicated in the picture and drawing. Model Z358-40-FMC can be specified/ordered with the following piping configurations under the following model numbers.